The Motorola Moto G4 Play was launched in May 2016, with an exceptionally low price for a smartphone. The G4 Play began selling at Rs 7500 and had a long and stellar battery life. This was a definite buy for anyone on a budget who does not need their mobile phone for heavy work or gaming. Motorola kickstarted its Moto G line of mobile phones in the year 2014 and built a very strong market base online. Its reasonably priced smartphones have always attracted a lot of customers. The Motorola Moto G4 Play released with some special features, including a light sensor, a proximity sensor and an accelerometer. 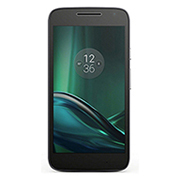 The Motorola Moto G4 Play comes with a 5.00 inch touchscreen and a resolution of 720px x 1280 px. A 1.2GHz quad-core processor runs the Moto G4 Play, with 16GB of internal storage and 2GB of RAM. The mobile accommodates a 128GB microSD card to extend its storage capacity.Motorola Moto G4 Play also supports dual sim. Moto G4 Play has a decent camera with a 8-megapixel back camera and a 5-megapixel front camera. This mobile phone runs on Android 6.0.1 Marshmallow and a 2800mAh removable battery. This mobile phone, however, has not incorporated a fingerprint sensor, a feature that is popular in its succeeding models. While the Motorola Moto G4 Play had a successful run in the market, there are now newer mobile phones with superior features. The Motorola Moto G6 Plus was launched in April last year with updated features and the recent software. If you are not able to spare much while searching for your new mobile phone, let Cashify help you out. 1. Cashify has a pricing model that is automatically generated. The portal asks you some questions about your current mobile such as the condition, the model number and the warranty period. 2. After checking the condition, based on your inputs, Cashify offers you a fair price for the mobile phone, complete with a doorstep pickup. This helps you sell your old smartphone sitting right within the comforts of your home. 3. The money for the Motorola Moto G4 Play is given to you immediately, the moment you hand over the mobile phone. You can make the payment in a method of your choice, it could be cash, bank transfer or e-wallets such as PayTM. The resale cash is given to you at your doorstep for the Motorola Moto G4 Play. Selling your mobile phone has never been easier. Cashify is the most trusted platform in India to sell mobile and other gadgets online for instant cash on pickup. Schedule a sale now!